Same deep lines, called lasolabial folds, along the sides of their mouths (see the yellow arrows I painted on the first side-by-side pics); same dimple-indentations at the corners of their mouths (see light blue arrows). Also, there is an interesting video, “Car Attack Victim Heather Heyer – Where is She Now?,” which was first uploaded to YouTube, but was taken down/censored by YouTube. Thankfully, the video was re-uploaded to Vimeo. Car Attack Victim Heather Heyer – WHERE is She NOW? from Steven P Revere on Vimeo. Great catch! If you put "both women" in a graphics program and "solarize" them, you can tell the wrinkles on the forehead are alike. Video was removed, of course. This is excellent research and likely true. It also likely would not take long for a good private investigator to document contacts of this individual with her "deceased" daughter Victoria, both by home visits and telephone conversations with her Mother since no one died at Sandy Hook and it is likely she is still alive some 5 years later. Someone should put up the money to hire such an investigator to prove she is still alive. After all who is the most likely person she would want to talk to frequently? Her Mother. 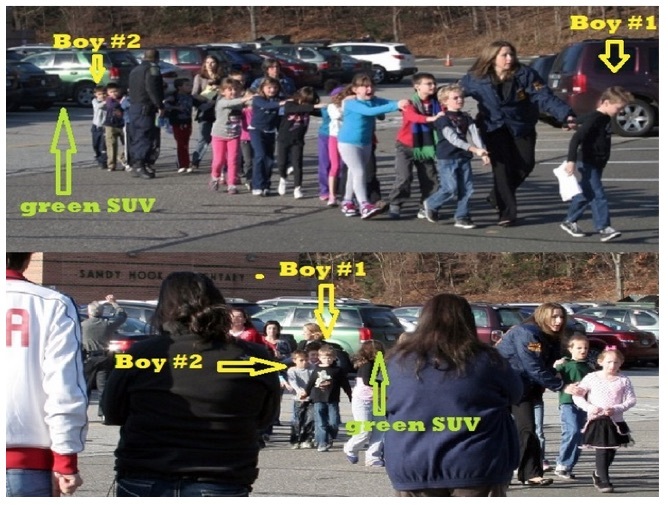 As a post script to the above comment since all 26 "victims" of the Sandy Hook Hoax Shooting were not killed, all of them are very likely still alive somewhere only about 5 years older. I believe pictures of them at the time all exist. Therefore with enough effort every one of them can be found and discovered and exposed to the light of truth and light of day. All it would take is the discovery of a single one of them to unequivocally prove the scam was fake. This is the type of research which must receive focus and money rather than convincing a duped ignorant brainwashed public that the event was a hoax. In fact if some of these "victims" were found it is likely one could finally go to a court somewhere and get an order to prove with forensic evidence they were indeed the scammers of this massive government hoax on its people. In fact even an 8 or 9 year old kid knew then and knows now and even later when he or she becomes an adult if they were at that school that day or not! When these kids become of age, usually 18 in most states, researchers must contact them about this. They will likely gladly cooperate with researchers and quickly spill the beans on this massive swindle of America. For example suppose a kid was 10 in 2012. Today that kid is 5 years older or 15. So we have only to wait another 3 years until that kid is 18 to question him or her without fear of reprisal because they will be an adult. Even if the age were 21, that would mean only 3 more years to wait to blow this scam wide open. All the adult criminals involved in this mass conspiracy crime against all Americans should think hard and long about the possible consequences to you in a few years. It would be much better for you to come forward now, today, and admit your guilt in this massive scam on America, in the hope that the judge would give you leniency and reduce your sentence from say 30 years in jail to say 20 years in jail. This includes everyone involved, members of the Newtown government, police, state police, district attorneys, Governor, anyone who aided and abetted this scam will be culpable. It's her! Also if you look at "Donna's" interview w/ Gail King, you will notice her hair is as gray as can be along her forehead. I also happen to find the name " Bro" very odd. " Say bro, is you a crisis actor?" Had to use a different browser to view the Heather Heyer is still alive and is a government hack. Both pictures of the Bro woman are there. which are the real Conspiracy Theory; while the scenario of Professor Fetzer, et al and the book "Nobody Died at Sandy Hook" are the truth not Conspiracy Theory. All the media are liars on this. A convincing argument was made, also I believe by Dr. Eowyn, that the Posner kid was represented by a picture of the "older' brother as a child. In other words the alleged deceased child never actually existed as a kid in the class at all because there was no class that day. Suppose we extend this concept to all 20 alleged deceased kids and all 6 deceased adults allegedly killed that day. How do we know, for example, that the alleged person called Victoria Soto was not a myth represented by an earlier photograph of her alleged Mother Donna Soto just like the Posner kid was represented by an image of his brother at an earlier age? Of course other possibilities are possible but isn't this a good place to start? Does anyone have any earlier pictures of Donna Soto at about age 27 before she gained weight? This would be the ultimate con wouldn't it? Not only was the school closed and the event faked but none of the alleged dead kids or adults ever existed in reality at Sandy Hook School. You could very well be correct, it could be " Donna Soto" or whatever her real name is at 27, unfortunately we have no photos of her at age 27. I believe Emilie Parker was really her mother Alyissa. By doing it that way the public would never be the wiser. Great work Dr. Eowyn! As always. The TRUTH never lies. All the TRUTHs exposed point to a singularity! They expose the LIES the (((sewer rats))) spin and the complicity of all who perpetrate these events. It's totally obvious. Thank you Jim for posting. Here's one of two videos I made of the two women's pictures being merged. Please check it out and offer your thoughts, are they the same person? Donna Soto's eyes appear larger because she's wearing magnifying glasses; it's very clear that this is the case. I've been sharing this all over the place, Yogi -it's very convincing. The teeth, the teeth!!! My point about the glasses was in reply to Jim mentioning that Donna Soto's eyes appear larger that Susan Bro's. I mean I've been sharing your "Compilation" video. I was thinking along the same lines except I though Emilie Parker never existed and her picture is of one of the two sisters. The Sandy Hook parents didn't seem to be upset all. Mr Parker looked absolutely gleeful. Watching SH families being interviewed with the volume down you get the impression they won the lottery instead of having just lost a child. Hmm. Maybe they were paid a huge sum of money and that's why they can hardly hide their joy. บาคาร่าออนไลน์ Online casino gambling sites offer investors the opportunity to play online gambling services that investors can come into play with. Just a gambler to use online gambling games with us here, you will not be disappointed.